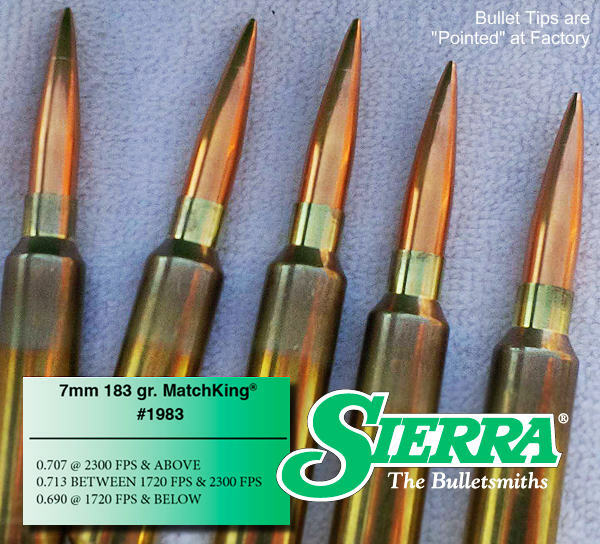 In case you haven’t heard, Sierra has a great new 7mm match bullet, the 183 grain MatchKing (item #1983). This bullet boasts an impressive 0.707 G1 Ballistic Coefficient (BC) at 2300+ fps. These bullets also have very consistent bullet-to-bullet BC, thanks to the tips being “pointed” at the factory. Sierra explains: “A final meplat-reducing operation (pointing) provides an increased ballistic coefficient for optimal wind resistance and velocity retention.” Top F-Open shooters have told us that these bullets shoot exceptionally well, with minimal vertical dispersion at 1000. “Holding waterline” at long range is a reliable indicator that the BC is very uniform from bullet to bullet. The design of this bullet represents a radical departure for Sierra. The 7mm 183gr MK employs a new bullet shape with a special geometry: “To ensure precise bullet-to-bore alignment, a unique bearing surface to ogive junction uses the same 1.5 degree angle commonly found in match rifle chamber throats.” Mark Walker, Sierra Product Manager, explains: “We thought instead of using the typical ogive radius that can allow slight misalignment, why not use the same straight angle that is used in the chamber leade on the bullet ogive to force itself to always align with the bore? Once past that area, we use a traditional high caliber ogive radius[.]”. Share the post "Anatomy of a High-BC Bullet — The New 183gr 7mm MatchKing"
GunTV presentations combine studio sessions with range time. The hosts begin, in studio, talking about a gun’s features. Next the show may feature range footage demonstrating the firearm. Then it’s back to the studio for the sales pitch. Finally, viewers can bid on the featured item(s). Non-firearms items may ship directly to buyers. However, all actual firearms are sent to an FFL dealer, which performs background checks and handles the required paperwork. 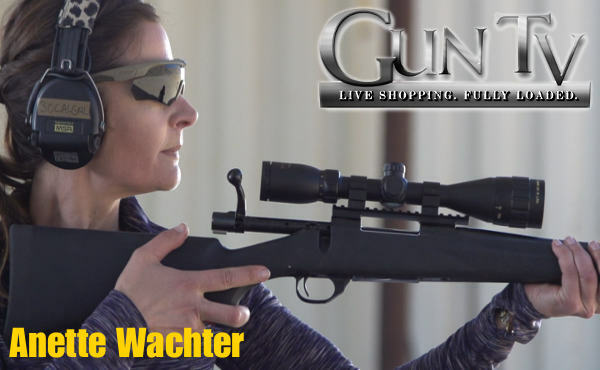 One of GunTV’s hosts is our friend Anette Wachter, creator of the 30CalGal.com website. Anette, a top-level Palma and multi-gun competitor, will be testing and reviewing products, as well as selling her signature 30CalGal line of custom jewelry. GunTV makes money two ways. First it takes a share of sale proceeds from items sold. In addition, it gets promotional fees from product makers. If you have a shooting-related product you want to see featured, you can advertise on GunTV. You can apply online using the Product Submission Application form. GunTV charges fees for its airtime segments and advertising spots and advertising spot production services. 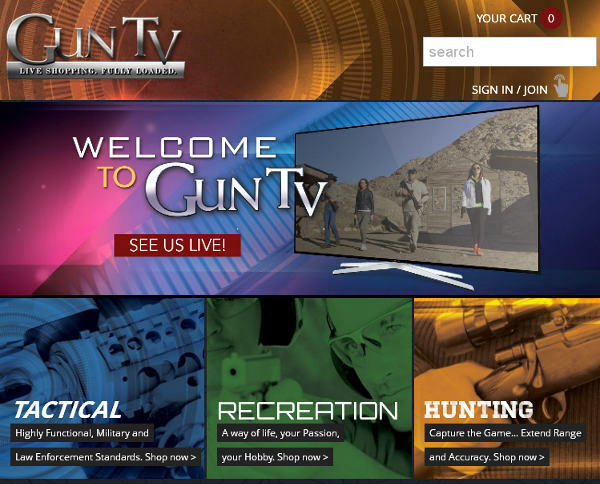 Share the post "New TV Shopping Network for Guns and Gun Accessories"
Guns are big money. In the past seven years, the dollars generated by the production and sales of guns and ammo have more than doubled. In fact, total economic impact of the firearms and ammunition industry in the United States increased from $19.1 billion in 2008 to $49.3 billion in 2015, a 158% increase. Meanwhile the total number of gun industry full-time jobs rose from approximately 166,000 to almost 288,000, a 73% increase in that period, according to a report released by the National Shooting Sports Foundation (NSSF), the industry’s trade association. Read NSSF Report HERE. On a year-over-year basis, the industry’s economic impact rose from $43 billion in 2014 to $49.3 in 2015, a nearly 15 percent increase while total jobs increased from approximately 263,000 to almost 288,000, a 9 percent increase in the same period. The Firearms and Ammunition Industry Economic Impact Report: 2016 provides a state-by-state breakdown of job numbers, wages and output covering direct, supplier and induced employment, as well as federal excise taxes paid. Access the full report here. Billion Dollar Federal Reserve Note image from Milliondollarbillshop.com. 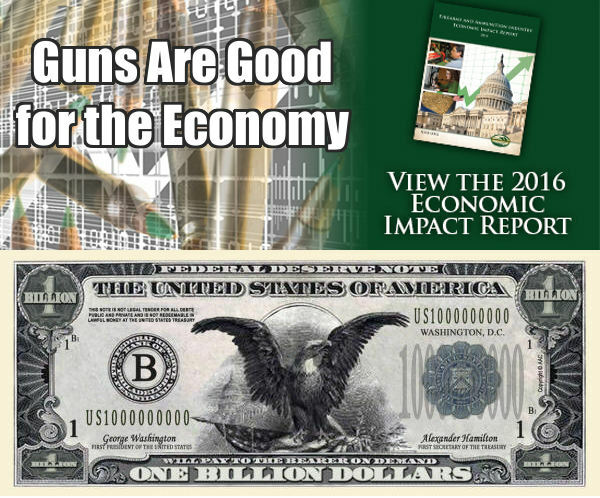 Share the post "Firearms Industry is a Now a $49.3 Billion per Year Business"